In the more than two centuries since the ghetto walls began to fall, Torah communities have often had to fight to preserve themselves. Those that followed the principle of separation from larger communal frameworks were usually the most successful in preserving their Torah identity. But that victory too came with a cost in terms of a diminished Klal Yisrael consciousness. "Most successful at preserving their Torah identity" is not quite accurate. Rather, the separationists were the most successful in preserving certain aspects of their Torah identity, while fundamentally perverting other aspects. In my monographs on the Novelty Of Orthodoxy and The Making of Charedim I presented several examples of innovations and reformations that came about as a result of trying to maintain Torah identity in the face of modernity. But perhaps the most significant reformation is that which Rosenblum himself mentions: "diminished Klal Yisrael consciousness." Being part of Am Yisrael was, traditionally, a major part of what being a Jew was all about. At a very fundamental level, Torah is about being a "giver" rather than a "taker." Every tribe in Israel had to provide people for the army, or engage in other forms of national service. Kol Yisrael Areivim Zeh Lezeh. But the ultra-Orthodox community did not preserve this part of their Torah identity. Instead, they jettisoned it. To some extent, Jewish statehood, which inevitably pits groups against one another in the battle for larger pieces of the pie, has exacerbated the problem of exclusive identification with one's own small subgroup. Yet the Religious-Zionist community still sees itself as very much part of Klal Yisrael. In fact, one of the most striking and significant differences between the charedi and dati-leumi (religious Zionist) community is with regard to its "Klal Yisrael consciousness." Another example of this was with the last Bet Shemesh elections, as I discussed in a post regarding the difference between charedi and dati-leumi rabbanim. The charedi rabbonim stressed how Abutbol, and the charedi party, are the best for furthering charedi concerns and the interests of the charedi community. In contrast, the dati-leumi rabbanim stressed how Eli Cohen is the best for all the residents of the city, from charedi through non-religious. One dati-leumi rav spoke in dismay about how a charedi friend of his assumed that if Eli Cohen wins, there will be "payback" and subsequent favoring of the dati-leumi sector. The dati-leumi rabbanim just don't think in those terms! All this is also very relevant to the current dispute regarding the draft. Everyone, from secular to charedi, agrees that the State of Israel needs a large army to defend itself. And everyone, from secular to charedi, agrees that the army presents a burden of spiritual and physical risks and challenges. The response of the dati-leumi community is to view the shouldering of these risks and challenges as part of their sacred duty to the Jewish People. The response of the charedi community is, "Why should we share in this burden? Let other people shoulder it all!" Furthermore, they don't even show any care or appreciation to those who do shoulder this burden. All they do is issue a poorly thought-out and deeply problematic claim that their Torah provides protection, which, as I've demonstrated previously, they don't even provide where the protection is needed, which they apply for selective protection, which they apply even to people not learning Torah, and which they don't even really believe anyway. To my mind, the Million Man March today in Jerusalem should be viewed in that light (and see Rav Ronsky's words regarding the rally, as well as Rav Druckman's). Sure, leveling criminal charges against charedi draft-dodgers might be a very bad idea, and unfair to young men who have grown up in a culture that did not prepare them for such a thing. But what else do you expect, when you have a sector of the population that has no interest in sharing the military burden, is deliberately under-employed, demands financial support from the rest of the country, and shows no hakaras hatov for the economic support and military protection that they receive from the rest of Israeli society? Why should other people be sending their children to provide the manpower for the army, but not charedim? How is it acceptable to demand that everyone else provide the soldiers for an army that you agree is vital? How is it acceptable to refuse to implement Chazal's directives about economic self-sufficiency for oneself and one's children, and to demand that the rest of Jewry provide financial support? How is it acceptable that when the rest of Israel is understandably frustrated by all this, to respond that they are evil haters of Torah and to shut down the capital city for an afternoon? Ultimately, today's rally is about a selfishly separatist community that wants everyone else to take the risks and pay the bills (and doesn't even want to thank them for it). It is an expression of a community which, to paraphrase Jonathan Rosenblum, has had its Klal Yisrael consciousness diminished. What a tragedy. As a case in point, how much chillul shabbat do you think was already caused within the police preparing for today's rally? Another example of the difference in approach to Klal Yisrael is with Kashrut. When faced with a Kashrut issue in general the Charedi approach is "How can I make sure that I get the highest level of kashrut on my plate". The Dati-Leumi approach is "How can the economy find a Kashrut Solution that works for everybody". For example, Shmitta issues have changed over the years, but in the past when most of the vegetables grown in Israel were grown by Jews, If some people refused to eat Jewish-grown produce using any solution (Heter Mechira, otzar Beit Din, etc), they were only thinking about themselves, their "solution" could not work at a national level - as the kibbutzim had to do something with their produce. Other examples are Shabbat observance, instead of finding a solution for Shabbat issues in hospitals or the army, the Charedim prefer to ignore it and let someone else deal with these issues, provided that their own personal Shabbat observance isn't impacted. Sounds like they are still in the SHtetel, where whatever happened outside the ghetto wall was not their concern. The argument that it was statehood which caused this is a perversion of history. Selfishness very quickly became part and parcel of the Yeshiva world - almost from its very founding. The Yeshiva students viewed themselves as an elite - set apart from the masses of Jews. The Mirrer Yeshiva bochurim who took double handouts in Shanghai (joint and special yeshiva fundraising collections) while other Jews in Shanghai went cold nad hungry - happened prior to the founding of the State. The State of Israel had nothing to do with that. Gafni and his ilk who wil seek "revenge" are just the spiritual descendants of those Mirer yeshiva bohcurim and ramim. My son is very shortly going into an elite unit in the army. I am embarrassed that I have charedi relatives who believe all of this progagnada spewed by the charedi leadership and charedi newspapermen. Someone in our shul expressed the very same sentiment, about charedi elitism: "When do we ever hear that a charedi Beit Knesset makes a מי שבירך for IDF soldiers?" Unfortunately, with sentiments as they are now, it will be a long time before Charedim will be convinced to make such a מי שבירך (more likely that they'll make a מי שפרע (Mishneh Baba Metzia, 4:2)). It would be a lot wiser for people on both sides of the argument to try to defuse the situation, rather than get everyone more militant about it. "The argument that it was statehood which caused this is a perversion of history." Not true. Statehood did pervert national and Jewish unity. It was the 2% threshold law that allowed the possibility for the most provincial factions to form a party and gain entry into the knesset. If all you need is 2%, then any narrow-minded, misanthropic, xenophobic group can be ensured of power. This party can then used its disproportionate leverage to thwart the will of the people. All in the name of democracy. 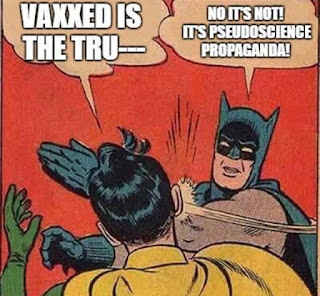 (Which of course they don't believe in.) There is then no need for compromise or understanding. No feeling of membership in a larger community. If that's the case, it's no wonder that the nastiest violence against haredim comes from their own. Whether it's the attack against haGaon HaRav Shteinmann, or the bizarre phenomenon of the competing rags Yated and HaPeles. Or the hired goons and stink bombs in Ponevezh. Or the infighting that leads some fanatical hoodlum to set fire to an apartment with a woman and child inside. Or the Sturmeresque posters attacking Haredim for fulfilling the halacha of במלחמת מצוה הכל יוצאים. The increase of the threshold means that parties must be formed and maintained on broader interests which in turn requires compromise and some level of achdus. When the Knesset debated the law, a certain Haredi MK went hysterical. In the same breath he accused the gov't of being anti-democratic (for preventing minority factions from imposing their will upon the majority) and discriminatory (for insisting on equitable national service). 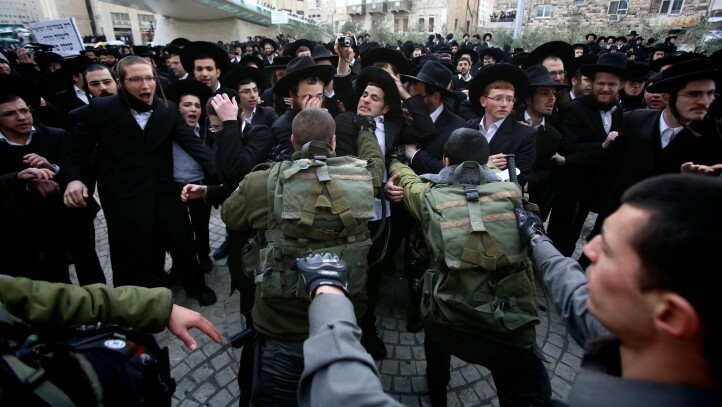 Ephraim - if you read objective biographies and history of the yeshivot and chassidic courts of pre-WWII european Jewry it will become obvious that haredi internecine violence was alive and well - and proverbially - kicking, well before the founding of the state. Moreover, in the good 'ole US of A - you know that wonderful land of pure torah values which will gladly support Torah and to which the Belzer Rebbe plans to move his court soon - internecine charedie violence is just as bad as it is here. Frankly when I heard that one of the Satmar Rebbes invited his brother in law the Belzer Rebbe to come over to America due to the impending draft legislation, all I could think about was the Belzer Rebbe's visit to NYC during the Ed Kock administration when the NYC police department had to call out the riot police squad. I would respectfully disagree with much of your analysis. While I am a Zionist and therefore disagree with the charedim's attitude in Israel, I don't think your analysis is really correct. Charedim historically have had a klal consciousness because they represented the majority. The question is: What do you do when you become a minority? That's a vastly different ball game -- when your society is under attack versus being in charge. Moreover -- particularly regarding Israel -- the charedim never wanted a state. It's not fair to say to them that... well, you didn't want a state, but now that we have one, share the burden. Why should they? They shouldn't be forced to participate in something they never were interested in seeing happen to begin with. Now, I agree that the charedim's attitude to having a state contradicts fundementals and cores of Judaism and Jewish history, and I agree that you can't take (entitlements) and not give back (perhaps the charedim's weakest point in the "fairness" category). But to say that charedim lack a klal consciousness today which they once upon a time possessed is extremely simplistic, misleading, and unfair, in my opinion. Yehudah - Charedim have never been a majority of anything. Charedism developed as a reaction to the destruction of traditional Jewish society, which itself had little in common with Charedism. And the idea that they weren't interested in the state being created is only (partially) true of the Old Yishuv. Most Charedim in Israel are the descendants of people who came to live there because the Zionists had made it viable to do so. To Charedim who claim that Torah students need not enlist in the Army because “Torah Protects”, can I ask a hypothetical question? We’ve all heard of Israel’s Iron Dome missile defence which fires its missiles to intercept incoming missiles eg from Gaza. However, Israel does not intercept every incoming missile, because Iron Dome’s missiles cost over $100,000 each. So if Iron Dome’s tracking system predicts that an incoming missile will hit uninhabited territory no interceptor missile is fired. Suppose Iron Dome’s tracking system predicts that an incoming missile will hit Bnei Braq generally and in particular Ponevezh Yeshiva. Should Israel fire an interceptor missile, or should Israel save $100,000 and accept the Charedi claim “Torah Protects” at its face value and do nothing? Unless Charedim unequivocally request Israel do nothing in such a case, it is clear that they depend on the IDF like all Israelis. As Rabbi Slifkin points out, in the final analysis, Charedim themselves do not believe that “Torah Protects”. So they must serve in the IDF like everybody else. > the charedim never wanted a state. It's not fair to say to them that... well, you didn't want a state, but now that we have one, share the burden. It occurs to me that it’s very simple to test whether Torah learning protects the learner. Arrange with a yeshiva to show up in the middle of the day and punch someone sitting and learning in the Beis Medrash. If you can, learning obviously doesn’t provide protection against physical attack. If you go around the room and fail to land any blows, then there just may be something to it. Joseph: This notion that Charedism is a modern phenomenon is way overdone. I think it is fairly obvious that if you transported an 1800 Eastern European Jew to 2014, he would feel much more at home among charedim than among the Dati Leumi or Modern Orthodox crowd. G*3: You hit the nail on the head. The charedim see the "Zionists" as foreigners -- similar to how they would view the British if the British ran the country. That's precisely why they're calling their conscription a "gezeira" -- the very same word they used regarding government laws in Eastern Europe that targeted them. The solution in this bitter dispute will lie, as always, with money. Everything ultimately comes down to money. The chareidi leaders-in contrast to their gullible footmen- are loath to lose the monies allocated and the jobs lost. Money is the root of everything. The Israeli government will continue to squeeze the chareidi budgets and, in time, the mgullible masses will see how they were misled by their leaders. A couple of things really bothered me about the march that didn't even have anything to do with the issue of the govt requiring chareidim to serve in the army. The chareidi world always comes down very hard against copying popular trends in the secular or gentile world. Yet they had no problem in copying the idea of a Million Man March, right down to the name! -- and let's not forget the origin of the very first Million Man March! It was in 1995 in Washington DC, orchestrated by none other than Louis Farakkan for African American men! The other thing that disturbs me that has nothing to do with the army/learning agenda is the huge chillul HaShem created by the trashing of the Holy City due to the immense amounts of litter left behind. It shows a complete disregard for Jerusalem and its holiness, not to mention disregard for the people who must be hired and city funds used to clean up after them. In short, they really do consider themselves to be the Lords of Creation. The universe was created for them and for them alone. Everyone else is fit only to serve them. And we should all be humbly grateful to obey their leaders and provide them with everything they demand so they can coerce the Almighty to continue turning the crank. The Israeli government will continue to squeeze the chareidi budgets and, in time, the mgullible masses will see how they were misled by their leaders. The Charedi budget has already eaten welfare, housing and assistance for the non-Charedi elderly, poor and disabled. It's cutting into medical care and IDF readiness. All that's happened is a doubling-down by the Charedi communities. It is important to recall that famous gedolei Torah like the Netziv of Volozhin strongly opposed R. Shimshon Raphael Hirsch's "austritt" (Orthodox separation from the general Jewish community in Germany) precisely because it caused a split in Am Israel. He said that it was a denial of the belief in teshuvah. Unfortunately the austritt policy because the predominant political philosophy of the Haredi community. It is also important to remember that when the state of Israel was created many people felt it would fall apart at the beginning because it was made of people, thrown together who really necessarily share a common culture. After all, what did a Russian Jewish atheist Communist have in common with a pious Moroccan simple Jew? They didn't even speak the same language. Even religous Jews from different countries often had a hard time getting along with each other ("their prayer book is different than ours, they can't be authentic Jews!"). Yet, Israel has succeeded in creating a country which, by international standards, has a strong level of national solidarity and cohesion. We could not have stood up to the ongoing security threats the Arabs are posing to us without it. Look at what is going on in Syria, Iraq, Ukraine, Belgium or what happened to Czechoslovakia. What is interesting is that the socialist ideology of the founding MAPAI-MAPAM-Left General Zionists which the politicians tried to use ("we will create a socialist state that will be a light unto the working people of the world!") to unify the people and give them a national ethos had largely collapsed by the time of the Six-Day War. The renewed contact of the people with their Biblical heartland set off a slow but steady renewal of Jewish/Torah conciousness among the majority of the Jewish population, even if most have not gone all the way and become completely Torah observant, but the trend is clear. Anyway, I am very pleased that Rav Jonathan Rosenbloom has had the courage to come out and state the obvious. I hope people draw the right conclusions from it. The simple question is: should we be behaving like a disparate group of communities, or as a nation? Londoner - your thesis has actually been put to the test in the REAL WORLD. Elyashiv Reichner an author and journalist who reports for Makor Rishon on the religious community and the negev (he lives in the negev), wrote this past friday that when the negev was under a missle barrage he was in Yerucham and went into the charedi Yeshiva Gedola. It was empty the enire day - as empty as the Ponovich beis medrash was yesterday afternoon. He then went to see the hesder Yeshiva. It was full of bochurim learning, and when they weren't learning during seder time they were out and about helping the residents of the town fix up and organize the public bomb shelters. Brooklyn, any chance that you can send me that article? One other factor that must be taken into account is that an elitist attitude, even if it is justified on the grounds of "we are entitled to extra support or consideration from the general community because we contribute to it more than others" is ultimately self-destructive. Thus, Haredi self-seclusion on the grounds of not wanting their young people to be exposed to other kinds of Jews will end up damaging their own society. A sense of entitlement due to greater responsibility ends up with subsequent generations being merely a feeling of entitlement WITHOUT the sense of the accompanying responsibility. A good example is the Kibbutz movement. In the early years of the state, the provided a high percentage of the army officers, and, at the same time, they were given bigger subsidies and handouts from the state in supposed recognition of their contribution (their immense political power within the ruling MAPAI party, far beyond the actual size of their population relative to the rest of society). This rapidly degenerated into a feeling of entitlement and an abandonment of the extra motivation to serve in the officer corps of the IDF, which has been taken over by the Religious Zionist camp in addition to people from previously 'peripheral' communities. This lead to the huge debts and scandals in the Kibbutz movement some years ago. A friend of mine warned that the Hesder Yeshivot and the Pre-Army Religious military schools, which motivate their students to high levels of service in the IDF and the general society must be very careful not to fall into the same trap. Thus, it is in the interest of Haredi society to break this feeling of entitlement and this can be done by educating their people again to realize that, if they believe that Torah study is truly a service to the country no less than military service, they MUST live up to the high standards the Torah deamnds from them, and so those who are not capable of living this intensive Kollel community lifestyle must go out into society and show the real importance of Torah values FOR EVERYONE. "It is important to recall that famous gedolei Torah like the Netziv of Volozhin strongly opposed R. Shimshon Raphael Hirsch's "austritt" (Orthodox separation from the general Jewish community in Germany) precisely because it caused a split in Am Israel. He said that it was a denial of the belief in teshuvah. Unfortunately the austritt policy because the predominant political philosophy of the Haredi community." Natan Slifkin - it was either this past friday or the friday beforehand in his regular column on the Negev which is the last page of the Yoman section (part 2) of Makor Rishon. Sometimes these end up online under his cloumn on NRG but I couldn't find it there. That's an excellent post, one of the best I've seen anywhere in a long time. I am not a historian, but I am wondering whether Rav Rosenbloom's assertion that "Those that followed the principle of separation from larger communal frameworks were usually the most successful in preserving their Torah identity." is a proven fact. I do know that Hirsch's demand that separatist Orthodox communities be set up was stronly opposed by many German Rabbis and that Orthodox communities that remained affiliated with the general "Gemeinde" community existed to the very end of the German Jewish community. It would be interesting to note also whether the drop-out rate of the youth from the separatist community was any lower than that of the Gemeinde community, it certainly existed there as well. The tragedy is that I heard a story of a community in Germany that had two Orthodox shuls, one affiliated with each of the two communities and the two top learned men in the community refused to talk to each other because each belonged to a different group. Treating people who belong to the "wrong" group as a non-person is TERRIBLE, but that is what has come out of this separatist mentality. How much damage did this mutual herem cause to the community they lived in? This is why the Haredi community has refused up until now to conduct a REAL dialogue with the Israeli people about how they view their role in society. Their policitican always leave it as "we are maintaining the Jewish nature of the country" and "the IDF neither wants nor needs our boys". THESE ANSWERS DO NOT SUFFICE! Why? Because there are plenty of people who are just as pious and learned who do serve in the IDF and one can ask "why do they NEED my son but not yours"? I understand the difficulty. It is not easy to say to the rest of Israel they do not recognize their legitimacy and that "we don't want our youth mixing with you and if we talk to you directly then our youth might think there is something legitimate about your views.". As I have said before, I believe the day has passed when the Haredi politicians can flex their muscles and play off the major parties against each other and thus ignore public opinion. As I feared, this demonstration has exaserbated public feeling (I have heard it myself). Thus, the leadership of the Haredi community needs to really think hard about how to communicate with the rest of us. Rav Rosenbloom's column may be a start. Yehudah, that an Eastern Europan Jew from the 1800s would feel more comfortable among Chareidim than among MO is because Charedim fetishize eighteenth-and-nineteenth century Eastern European Jewry. Which community would a fifteenth-century Venetian Jew feel more comfortable in? A twelfth-century Spaniard? A nineteenth century German? If your point is that Chareidism goes back to nineteenth century Eastern Europe, that’s also not really true, but even if so, that would still make Chareidism a modern phenomenon. As for treating the Israeli government as foreigners, okay, but then the argument that they didn’t ask for a state and so can’t be expected to share the burden of one is disingenuous. They just see all governments that aren’t Jewish theocracies as invalid, and all governments that don’t share the view that they’re special needs are requirements as oppressive. "...I am wondering whether Rav Rosenbloom's assertion that "Those that followed the principle of separation from larger communal frameworks were usually the most successful in preserving their Torah identity." is a proven fact. I do know that Hirsch's demand that separatist Orthodox communities be set up was stronly opposed by many German Rabbis and that Orthodox communities that remained affiliated with the general "Gemeinde" community existed to the very end of the German Jewish community. It would be interesting to note also whether the drop-out rate of the youth from the separatist community was any lower than that of the Gemeinde community, it certainly existed there as well." Gemeinde communities also had many of their own separate institutions--which they obtained using leverage from the threat of going separatist. Before R' Hirsch made this threat viable, Reformers in some areas imposed their own unilateral changes to Judaism: closed mikvaos, had Torah study outlawed, etc. I sympathize with the feelings behind your desire for One Jewish community. But how far would you go? For example, would you advocate that all Jews in Israel--Chareidim, Mizrachi, Leftist, Likud, etc.-- send their children to the same public school? Would you risk your kids in an atmosphere of rampant promiscuity, drugs, violence, etc. on the (probably low) possibility that those with Torah values would be more influential than influenced? I get the sense that this post would be more accurately titled "Rosenblum Kinda Nails The Problem With Charedi Society"
> the charedim never wanted a state. It's not fair to say to them that... well, you didn't want a state, but now that we have one, share the burden. Why should they? They should because whether they like it or not, they benefit immensely from the state - be it from Yeshiva/Kollel funding, socialized medical care, tax exemptions for Kollel families, paved roads, protection provided by the SOLDIERS of the state enabling them to move about freely...the list goes on and on. What is not fair is for an entire segment of the population to receive these benefits without contributing to the mechanism (i.e. the State) that makes it happen. 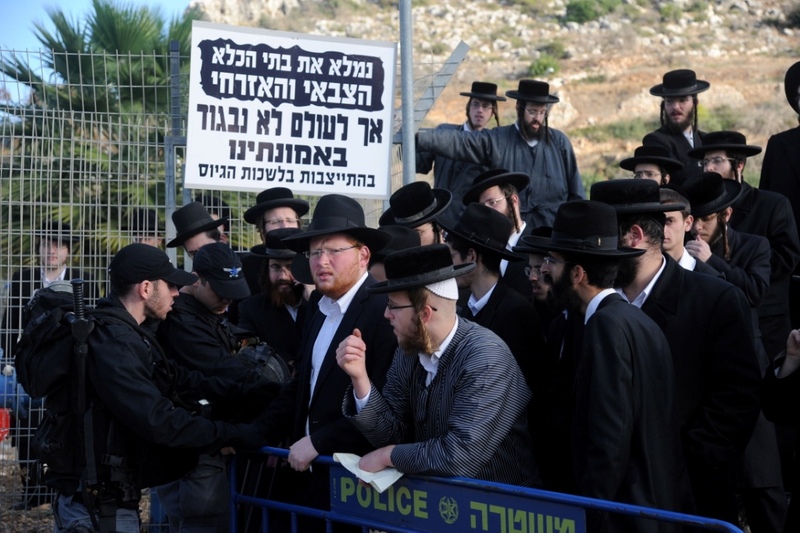 If the Haredim are really serious about having never wanted a state, they can prove it by moving to an area such as Ramallah - it has Kedushas Eretz Yisroel, and no one will make any demands that they share in the burden of the Zionist state. How do you think that would turn out? I apologize for confusing Netivot with Yerucham. I sympathize with Andy's comments - and I think that Beit Avi Chai and Tzav piyus made a HUGE mistake in jumping on education Minister Shai Peron's advocating mixed secular/religious schools as a "lechatchila" choice (talking about spitting in the wll one drank from...). There is no reason that communities can't have some degree of autonomy in the educational sphere - which is best left to the local community. However, that has NOTHING to do with the defense of the country which by its nature is something that falls on the collective. The State can - and does have - multiple educational streams. It can suggest - and does - that unless certain minimal curricular standards and/or open admissions criteria are in place then no, or reduced, state funding will be provided. But a State can't have more than one army - and all citizens need to be behind that army. It is a particularly good strategy to use if you are one whose feet or hands perspire regularly. And even if you are not, applying gentle coats of Funginix throughout the day can keep the solution strong and sometimes decrease treatment times try it.